As we move close to the official release of iOS 12, Apple has updated their official iOS adoption tracker. 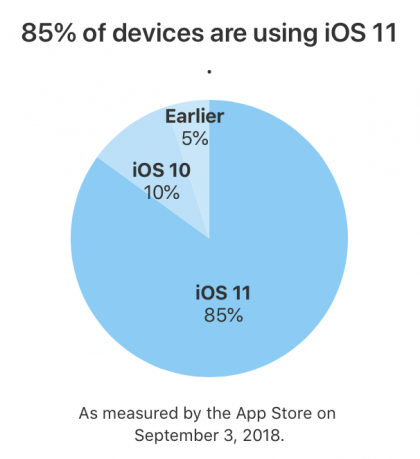 85% of active devices, as measured by the iOS App Store, are using iOS 11, as shown in the pie chart below. 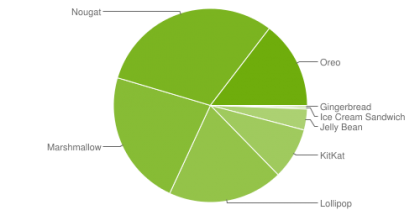 The two most recent versions of Android are Android 9 Pie (officially released on August 6th) and Android Oreo (August 21, 2017). As you can see, Pie has not yet made a dent in the universe and Oreo is approaching 15% (when you combine Oreo 8.0 and 8.1). What a difference between the two platforms. The largest issue caused by this fragmentation is the inability to get critical updates out to the masses. Apple is about to release a brand new OS, and it will work on the vast majority of iPhones in the wild. And there are no carriers or third party manufacturers that stand in between users and their updates.